This article was originally published at The North Star. At this point, most people are pretty familiar with Kshama Sawant’s election to the Seattle City Council. Sawant first ran for the Washington State House of Representatives in the fall of 2012 and used her notoriety and unexpected positive reception to run again at the municipal level in 2013, defeating her opponent Richard Conlin in a tight race. In the weeks that followed her victory, very different parts of the US left have weighed in on what the election of a socialist to office in a major US city means. As Nate Hawthorne has pointed out, most observers have fallen into two camps: those who welcome Sawant’s victory and look to it as a model for the future struggle, and those who are skeptical or even suspicious that this is a cooptation of radical ideas and working class anger. The core debate is really not that new and these positions play forward age-old debates, but they take on a special kind of importance because for the first time in recent history Sawant represents a measurable impact of the radical left. Since I think it’s fairly self-evident that you’re not going to vote socialism into power in the United States, I’d like to spend the bulk of this article talking about why I’m generally supportive of the Sawant campaign and respond to the criticisms posed by Black Orchid Collective and others. After interviewing Sawant and her campaign assistant Anh Tran, I’m convinced that the campaign is genuinely interested in using elected office to build movements, that Sawant and Socialist Alternative have no delusions about the role of the capitalist state, and that the Sawant victory was the result of revolutionaries taking advantage of an opening in the political system and not an accommodation by capital. Part of what has caught everyone’s attention about Kshama Sawant winning as an open socialist is that it represents something very different in the political culture of the United States. We are used to entrenched anticommunism and Tea Party right-wing populism, so to see a socialist woman of color win an election should throw up a red flag. So what happened to make this possible in the broader political climate? As we know, the financial crisis in 2007-2008 created widespread anger. The big debate on the left at the time was what would happen in the aftermath. Some hoped that Obama would create a kind of New New Deal, others expected to see worker backlash like in Argentina in 2002, and many radicals hoped for a growth of a new radical movement and something akin to the formation of the CIO. Apart from some pockets here and there, that didn’t happen. Capital’s response to the crisis has been unified in pushing for austerity and gutting social programs. Naturally, this pisses people off: polls show overwhelming disapproval of Congress and a lower opinion of both parties than usual. The institutions that have typically represented the working class however have been totally disoriented when dealing with a regime that has no interest in negotiation. Without political expression, popular anger manifested in the semi-spontaneous movements of 2011: the indignados, Arab Spring, the Wisconsin Uprising, and Occupy. Those movements were resoundingly defeated in 2012, and in the US political energy returned to its regular rhythm and the pragmatism of a presidential election year. The occupation of the capital building during the Wisconsin Uprising. This to me is an important political duality: on the one hand you have a popular rejection of austerity and immiseration represented by Occupy, but on the other hand you have elections that present no substantial alternative and in fact naturalize the process. For most people, both standpoints exist simultaneously and unevenly, which Gramsci referred to as dual-consciousness and Marx explained by saying, “The ideas of the ruling class are in every epoch the ruling ideas, i.e. the class which is the ruling material force of society, is at the same time its ruling intellectual force.” What’s more, people learn political lessons from experiences in their lives: if you struggle hard and don’t see a result, most people feel powerless and think that struggle wasn’t worth their valuable time. On the other hand, if you see an indisputable victory, it makes you bolder and want to fight for more. The curious absence of a sustained popular movement in response to the crisis and austerity is part of why these conversations are so important. Black Orchid’s explanation of this phenomenon is that capitalism develops “shock absorbers” in the institutions of “social democracy”, trade union bureaucracies, NGOs and the like that soak up the natural growth of anger and revolutionary fervor. If only that were true, our lives would be much easier. We have to face the serious diminution of the left’s infrastructure over the decades. I don’t want to rehearse what we all already know — the decline of trade unions and their bureaucratisation, the decline of the Labour Left, the disappearance of several left-wing organisations and publications. And it’s not just the Left; there has been a general withering of popular voluntary associations, the decline of politics as such, and an increasing privatisation of social life. You know, we can talk about the rise of social movements, and I agree that has been an extremely important fact of the last forty years or so. But the striking thing about these movements is that they rarely leave much behind. They rise, there is a moment of euphoria, of expanded possibilities — and then the ruling class, the state, the police and so on, adapt, change tactics, find ways to shut it down, and there’s little to show for it. None of the successes are institutionalised, while the losses leave a psychic residue that warns people off. Rather than having a high degree of struggle that’s coopted or suppressed by “shock absorbers” on the left, the period seems to be characterized much more by fewer, more episodic struggles with low capacity and less left behind. The situation seems to become only more desperate as austerity policies grind working people even further while creating a sense that these are individual rather than class problems. This is where Kshama Sawant comes in. 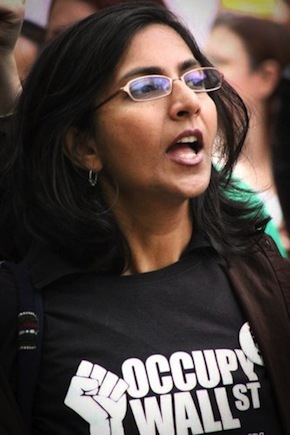 With Occupy in decline, Sawant and Socialist Alternative decided to “occupy” the political space reserved for elections in American society rather than retreat with the movement and wait for the next uprising. They presented an intelligent, charismatic candidate who was part of a popular movement and created a savvy campaign interpreting the message of Occupy for specific issues in Washington State. Sawant addressed economic issues that were invisible in mainstream politics and presented alternatives that were bold but realistic — they ran under a socialist banner, but they weren’t caricatures of socialists comically calling for the dictatorship of the proletariat. Electoral rules were arguably more favorable to Sawant in Seattle than they would be in other US cities. Officially, Seattle has nonpartisan elections, which force races to be only between two candidates after a primary but don’t require party sponsorship for ballot access — a rule that routinely prevents third parties from making the lists. City alders are elected at large so Sawant was able to run for any seat that became available, rather than waiting within her district. She could then campaign throughout the whole city, making her candidacy a larger issue and rallying more of the city to her side. In terms of the actual voting process, ballots in Washington State are mailed directly to voters giving them a longer window to cast their votes (days rather than hours) without having to worry about scheduling around the working day or waiting in lines. This last point became important in the final days of the vote count because the results were staggered by mail-return, and it gave activists more time to track down disqualified ballots in their favor, awarding them the election. But while Sawant and the Seattle elections are part of the general mood may be a microcosm of the national mood, the specific political arrangements in Washington State I think are what made this victory possible. Back in 2012, Sawant pointed out that there is a delicate balance of power in Washington State. The Democrats have been the singular ruling party for years (though Eastern Washington is Republican ruled). In Western Washington city politics are essentially no-contest races; the only real races are primaries within the Democratic Party. Sawant made that point to explain that the liberal Democratic Party with ruling power has not done anything to address needs in Washington, which was the starting point for a strategic socialist election campaign. Richard Conlin, who was Sawant’s incumbent opponent. 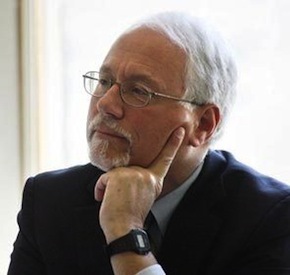 People in Seattle may be unhappy with Frank Chopp, Richard Conlin or any other Democrat, but given their predilections they aren’t going to penalize them by voting for a Republican. Electorally, this situation creates a kind of liability when there’s no “guard” against voting to the left of Democrats, but until Sawant it hasn’t been an issue that’s seriously needed to be addressed; does it need to be pointed out that there is a dearth of serious left candidates? In Seattle, Sawant could not “spoil” the election for a Democrat and award it to a Republican, as would be the case in most US elections, which is the greatest protection against left candidates. Dan La Botz has also pointed out that both Kshama Sawant and Ty Moore in Minneapolis ran in cities with a higher concentration of young people. Polls consistently show that young people have more liberal or even left wing views, so these candidates were able to draw upon a pool of voters potentially more inclined to vote for a left candidate when given a fair opportunity. When someone like Sawant is able to present themselves as a legitimate candidate in these conditions, addressing issues people actually care about without the threat of “making things worse”, they can take advantage of this opportunity and potentially win against the establishment. However, contrary to some of what Socialist Alternative has said, these are important factors for determining whether similar campaigns could be successfully replicated in other parts of the country. What’s interesting in the whole discussion about Kshama Sawant is that no one doubts her character or her intentions. Often when progressives or left-leaning candidates run for election, they have very uneven positions, contradictory worldviews or conflicting interests that mean we have to put them at arm’s length. But Sawant is an avowed revolutionary socialist, and even for her critics on the left they don’t doubt that she means to do what she says and isn’t running for her own personal interest. The problem that anarchist and autonomous-leaning leftists have with Sawant tends to be more of a structural or strategic nature: using “the state” will coopt movements in struggle, corrupt leftists in office, and ultimately can’t deliver revolutionary transformation. There are nuggets of truth in these criticisms, but for this situation I think they are more misleading than actually helpful. Starting with the concrete, we have to look at the Sawant election in its time and place. For all intents and purposes, the Occupy movement defeated by the end of 2012 when the camps were cleared. The left retreated with the movements since the environment of mass struggle quickly disappeared. Morale dropped, activists hunkered down, returned to ongoing projects or hoped for a next upsurge; many far left groups that oriented themselves to the higher degree of struggle that Occupy seemed to embody started to splinter or fall apart when this episode concluded and things went back to “normal”. And with the lower movement energy, the election calendar did what it always does and eclipsed popular dialog for pragmatic politics. With this in mind, I’d argue that the Sawant campaign did the best thing for the movement as a whole. In their own words, they “took the message of Occupy to the elections”, using the political space typically reserved in elections to not only preserve the common sense that came with Occupy but even to extend it into concrete proposals for Washington State. Sawant’s campaign for Washington State House of Representatives was the testing ground, and when it was more successful than they expected they ran again for Seattle City Council less than a year later. Their campaign linked with the $15 Ordinance for the nearby city of Sea-Tac, with Boeing workers fighting the company’s threats to move, and then became a kind of national icon as an alternative to austerity politics, which has since birthed copycat campaigns in other cities. Given that the movement was in a low ebb and that the oppositional class consciousness brought out by Occupy could have been lost, it seems to me that for the moment it was in Sawant’s election was the best thing to foster social struggles in Seattle and the US. 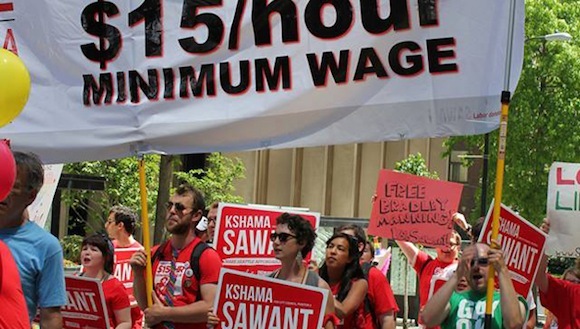 Sawant had roots in local organizing, including the campaign for a $15/hr minimum wage. But then there’s still the deeper issue of relating to the capitalist state. The critics are right to point out that you’re not going to vote socialism into power in the United States — the rules of the political system are in fact designed to keep government positions in the hands of ruling elites. Even if we somehow imagine radicals winning the majority of the government, I agree that the form of the capitalist state isn’t suited to revolutionary transformation. Lenin, following Marx and Engels, tried to explain that this was the reason that the capitalist state needed to be smashed in the course of a revolution and that new, actually democratic institutions should be erected in transitioning society. On its face that presents a contradiction: if you can’t win power through elections, if the capitalist state has a history of seducing movement people, and if you can’t use the state for revolutionary transformation, why bother with elections? The simplest answer is because you can’t ignore them. Elections and positions of office are real to most people, including activists, even if we understand them to be social relationships in the absolute sense. Policy, laws, taxes and all the rest have actual effects on the lives of working people and as a result working people have a material interest in engaging with what decisions will be made, even if they understand the whole structure to be broken — it’s a pragmatism that helps reproduce the social order. Movements on the ground shape mass consciousness, but they can’t go on forever and will eventually need to have something to show for all their effort. Without victories, capitalist hegemony tends to be reinforced — the sense that there isn’t an alternative starts to solidify and the time we put in the movement feels like a waste when you think about how you could have spent it on survival activities (working more; reproducing yourself; enjoying your free time; whatever). Revolutionary socialists trying to navigate these waters I think look at elections as a means to an end, and not an end in itself. Breaking the political monopoly the Democrats hold isn’t so that there can be a new political duopoly with a socialist party, but it is to dismantle the pragmatic chokehold the Democratic Party has over working class issues. Changing the political system and forming an independent party are conceived of as a precondition to allow for more struggles and more victories, just as smashing the state is a precondition for socialism. Revolutionary movements develop when workers and the oppressed understand that change cannot come through existing channels and that the whole order needs to be overturned; part of running in elections shows that its not the problem of any individual politician but the organization of society that is the issue itself. Therefore, even while its critical to deliver some gains in office, the larger goal is to educate about the system and build greater organization. 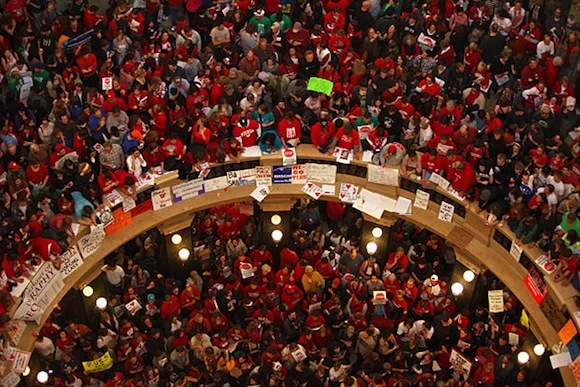 The point of having revolutionaries in office is to lend the credibility, legitimacy and resources the office holds to movements that are ignored, demonized or suppressed and act as a guard against maneuvers by state officials when possible, recognizing that ultimately mass movements will bring about social change and not political offices. The last part of this equation is the effect that actually being in office will have on a person. Unfortunately, there seems to be more visibility for former New Leftists who have, to borrow BOC’s formulation, become Democratic Party officials, union bureaucrats or heads of NGOs. What’s to say that something similar won’t happen with Kshama Sawant? After interviewing her, seeing her tour and watching some of her speeches, I’m reasonably convinced that Sawant is acting in the older communist tradition rather than the Popular Front “insider strategy” that the Communist Party adopted in the late 1930’s and that Maoists later took up as well. Rather than seeing the state as an abstract, absolutely corruptive force, you start by looking at the structures or practices that the capitalist state deploys to seduce elected officials, revolutionary or no. There is more to say on this than a single essay can really do justice to, but for the sake of argument we can name out some of these features that create a corruptive environment: a complex bureaucracy; undemocratic appointments; high wages that make officials stop identifying with working people and see the post as valuable in itself; a military/police force without public accountability. The parts of her platform that don’t relate directly to economic issues like the $15 minimum wage, rent controls, or public transportation are actually about confronting some of the worst state practices in Seattle. Sawant has called for a moratorium on drone surveillance and for a citizen review board over the Seattle Police Department in large part to confront the SPD’s extrajudicial killings. These seem like fairly clear cases of the things revolutionary socialists have typically done at their best, and seem to only have shaped a common sense of what’s right and what should be done for people in Seattle and anyone who’s followed the case across the US. Even if the surface pressures of office prove ineffective on Sawant, she will still have to deal with the institutional pressure of effectively delivering for her constituency while being an opposition candidate on the city council. If other councilors and major investors in city development decide that Sawant can’t be worked with, they could decide to isolate her, withhold financing or use her as a scapegoat for new problems the city will inevitably face. Sawant has not been explicit about this particular dilemma, quite possibly because its terrible propaganda, but she does seem aware that the success of her position rests with the activity of workers and social movements — if Sawant can reasonably state that she has no choice but to hold fast because of the militancy of her constituency, she has a greater capacity to withstand these institutional pressures and remain a steadfast advocate. I’ve tried to analyze the specifics of the Sawant election to show what its value has been for movements at the present moment and for shaping the common sense about what people deserve and what can be done. I’m not a member of Socialist Alternative and I disagree with many of their ideas and pronouncements, but whether or not you agree with their politics isn’t the point here if we look at what they’ve done and the effect its had. It seems to me that Sawant and Socialist Alternative constructed lively campaigns that drew on the energy from Occupy and kept the movement from being pushed into the annals of history. The cities in which they’ve run campaigns have all had a much younger demographic, potentially with fewer structural ties to the Democratic Party. In Seattle, the Democratic Party was probably at its weakest due to its electoral rules, movement activity and political history that left it without a right-wing guard, which would render Sawant a spoiler and prevent her from being a serious candidate. For those reasons, I don’t think that Sawant’s campaign will be very reproducible in other cities, but there does seem to be a growing interest in independent political campaigns, such as the labor candidates in Ohio and the Chicago Teachers’ Union political initiative. Given that each US state has very different rules and political cultures, those initiatives will have to look different place to place to suit the needs of the time and place. While most of the criticisms and concerns about Sawant’s election have focused on the corruptive influence of holding public office, I’m reasonably confident that Sawant has taken the proper precautions to guard against being seduced by the position and its absurdly high pay. What seems like a greater issue to me will be whether she will be able to make enough progress on the issues that got her elected. Sawant is one city councilor among nine, and an open socialist who regularly denounces the Democrats and the way city business has been handled. The danger seems to be that the other eight officials and the mayor will attempt to encircle her and frustrate her attempts to introduce legislation in order to pressure her into accepting compromises and deliver the message that only Democrats can get things done in the city. Given how much what a symbol she’s become, Sawant’s successes or failures will have a greater impact on the left and independent politics. Luckily, Sawant as a revolutionary socialist has been very clear that ultimately the most important factor in social change will be workers in their workplaces and movements on the ground. The best-case scenario is that winning some of these reforms will embolden movements, give them the confidence to demand more, develop more militant struggles and form new and stronger organizations. Andrew Sernatinger is an activist in Madison, WI. He is an editor of Black Sheep: A Socialist Podcast. Thanks for your thoughts on this Dianne. A quick clarification is that I don’t think that having elections at-large or mail-in ballots are an advantage in general, but for this particular case I think it was helpful for Sawant’s campaign. Specifically on the at-large seats, it seems to me that the timing between the two races Sawant entered were excellent for her. She built a lot of notoriety running against Frank Chopp, and if she had to run in a district she might have had another opponent that was less of a foil for the problems in the city and Washington State, she could have had a gerrymandered district that divided votes from her base, or she could have had to wait longer for a seat in her district to open up, which would probably have halted her momentum from the Chopp race. Anh Tran said in her interview with Tessa and I that one of their proposals to reform city elections is to move to a districted election system, so I imagine they’re at least somewhat aware of the issues Seattle’s electoral rules pose. I think this article is well argued and well written. As someone who has run socialist campaigns in the past, I find Sawant’s very similar to the Socialist Worker Party’s campaigns of the 1970s, where our program was very much related to ongoing social struggles. I was pretty surprised by Black Orchard’s response, which seemed sectarian. 1. Running city-wide: This is a big task. About 15 years ago, when Detroit’s City Council was elected city wide, Solidarity supported several independent candidates. They didn’t place very high and were discouraged. (I believe no independent candidate “wins” first time out.) I do believe it is easier to make an impact when the council seats are by district. I agree with Andrew that Sawant’s victory isn’t easily replicated. So the proposal that has been floated to have 100 such campaigns sounds off the wall. Nonetheless, the fact that socialists are getting together to discuss possible campaigns is important! Hopefully Solidarity members, socialist activists and Green Party members can work together whenever such possibilities arise.